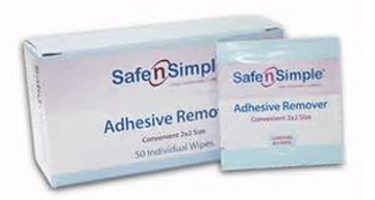 Safe N Simple Adhesive Remover safely removes adhesives left from skin barriers, wafers, tapes, and hydrocolloid dressings. Safe n Simple Adhesive Remover effectively removes residues from the skin that can reduce wear times and leaves the skin feeling fresh and clean. Size: 2" x 2"